What do social change and music have in common? Much more than might be readily apparent. The mentors at the Atlanta Music Project are proving that they can be intricately and exquisitely related. They know that all children have a budding musician inside of them. When they access the music, kids gain an invaluable creative outlet. In order to nurture their musical muse, they must practice regularly — something which helps develop discipline — and, the joy they get from performing contributes to positive self-esteem, which is so important to cement early in life. Positive self-esteem, discipline and creativity all help kids become motivated and happy adults. And that’s where social change comes in. In their raised awareness, these adults will be able to compassionately bring about change that benefits our communities. The Atlanta Music Project is committed to giving underserved young people the opportunity to make music and more with its music mentoring programs. First, they provide students with a musical instrument. Then, AMP enlists world-class professional musicians to be their teachers. Finally, they offer opportunities for performances, after students have put in their time and energy to learn their parts. It’s mentoring at its best! 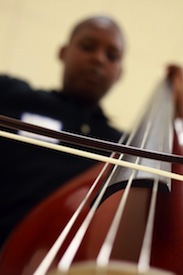 Students learn from accomplished musicians like Ismail Akbar, a cellist from Atlanta who has studied at the Oberlin Conservatory of Music, and has played Carnegie Hall. Mr. Akbar has recorded with Take 6, Wycliffe Gordon, and Neil Sedaka among others. Aspiring violinists might receive lessons from Teaching Artist Yulmarys Zambrano, an accomplished musician who teaches in public school systems, and privately. We, at the Over My Shoulder Foundation, congratulate the Atlanta Music Project for its far sightedness and engagement in helping young people achieve their potential in such an enriching way! Learn more about this and other music mentoring programs.